ago and just couldn't wait to wear it. Well I hope everyone had a good weekend and Happy March! Also, If you have tumblr be sure to add me to let me know of yours! I love the colors on your sweater. I bet your closet is filled with florals, so jealous! wow i love this sweater so much! you look just lovely. happy spring! That sweater is to die for! I love it! love it! I'm the same way, I'm leaning towards cardigans for most of the spring! i have two floral sweaters i'm specifically saving for the first two days of spring! oversized sweaters never work for me ... they're always too wide instead of long! yay! happy march, happy spring! i loveee your sweater! it's so pretty against the background. I love love this look. This floral sweater is gorgeous. That sweater is beautiful! So playful, perfect to offset the still kinda gloomy weather! You look great. I love that little bag of yours! You look fabulous in that dress! By the way, how did you styled your hair? It looks so awesome as well. i wish it were spring here already! aaah florals...I love them...I just can't get enough!! the sweater look so spring-like! What a pretty dress my dear! The weather has been so good here too. this dress has such a pretty floral print! 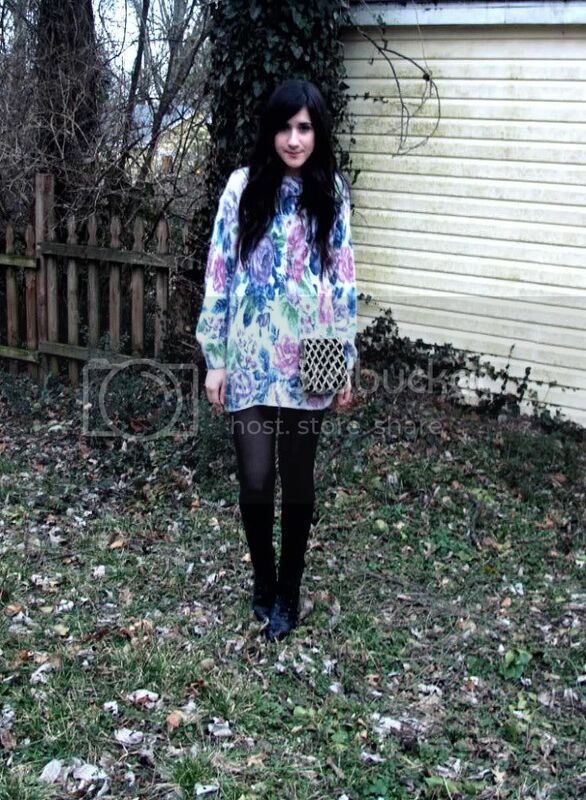 love the sweater, looks like a perfect dress for autumn, the floral pattern it`s so pretty and looks perfect with that bag. looooooooooooooove the spring! i can't wait till it warms up in ny. love your flower dress...too cute! I love that floral sweater! 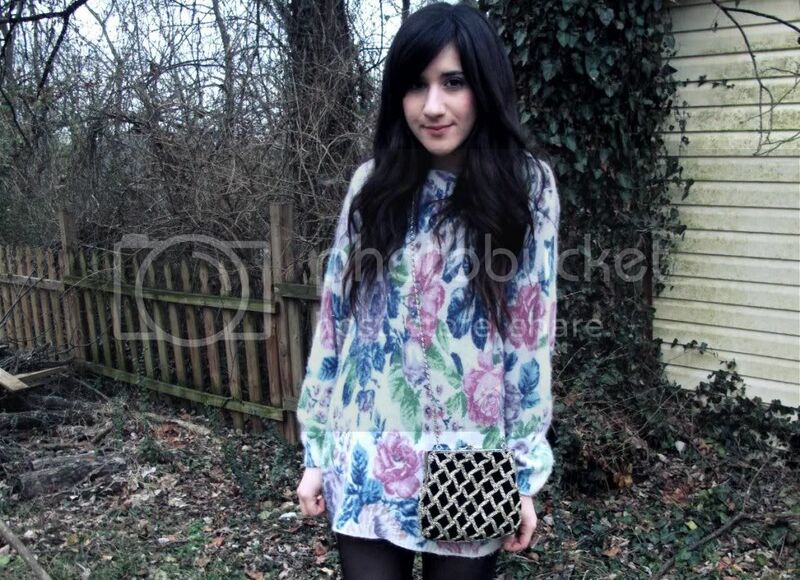 Aww that floral sweater is so pretty on you, at first I thought it was a dress :P I love that bag! i really love your sweater...it looks super soft! you look so cute in this dress and i love your bag!! I love your shirt and the colors :) You look good. i loveee your sweather!! !so cute and lovely!! love the sweater!! such a great spring outfit! thanks for the comment girlfran. love your outfit, i can't wait to pull out all the stops on tights and short shorts in spring. Wow, great blog - love all of your outfits! I´m also into floral prints for this spring, well actually at every time of the year :) so pretty! I just found your blog! I love your style! New follower! You have the sweetest style! That thrifted floral sweater is a great find! Nice sweater. I like it! I want to spring but i don't know where it is. Ps. I'm sorry but I think my English isn't ok.
Great sweater! I love to wear thrifted cardigans and sweaters. Love the pretty hues in the sweater! You look so cute! I love the floral dresses that are so popular this spring. This one is beautiful!